When we on the kumbia queers concert talked to people about cultural appropriation we got in a very naked way racist violence from kumbia queers. 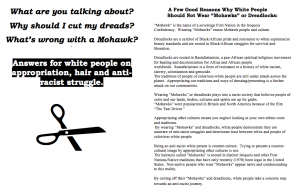 We asked the white people with dreadlocks, mohawks and tunnels and etc. to inform themselves about cultural appropriation and put on a hat or in other way to cover it before they enter the space. The band blocked the door and said that nobody can go in until the white people with dreadlocks can go in. they also said they would not do the concert at all if we keep doing this. Using their power position and making us pressure. The band was violent and racist to the Black and PoC-awareness team when they tried to explain the point. The members of kumbia queers kept on repeating that they didn’t know about the topic before. Now we put it here to make clear that we don’t accept cultural appropriation any more. Next time there will even not be the compromise of covering dreadlocks etc. There will be no way in.